Do you have a cat at home? Do you consider your cat a part of your family? On average, about half of US households have pets. Of those households, about 35% have cats, and on average, most households with cats have at least two. Most people understand and acknowledge the importance of routine veterinary care for their pets. However, studies have shown that about half of cat owners don’t make annual veterinary visits. The primary reason for this is reported to be because their pets don’t get sick. But what if your cat is sick and you don’t realize it? Cats are very good at hiding how they are feeling, especially when they are sick. This is an innate instinct so that they can keep themselves safe in the wild. Cats can often have an underlying medical condition, but appear fine physically. Subtle changes in condition or behavior may provide clues, but often these are missed by cat owners, or are thought as normal cat behavior. However, when discussed during a veterinary visit, that subtle change may be the first indication of an underlying medical condition. Associated wellness exams can help to identify specific concerns. 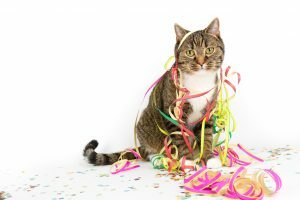 Health changes can occur very quickly in cats, and early detection can mean easier management, improved quality of life, and often less overall veterinary costs. Cats are at risk of some common medical conditions once they reach middle age, and especially once they are senior pets. And therefore, it is important to have your cat examined regularly by a veterinarian. One thing often recommended when cats reach middle age is wellness bloodwork. Cats are great at hiding illness and often bloodwork gives us the best information to help make a diagnosis. About 30-50% of senior cats will develop chronic kidney disease in their lifetime. We often diagnose this when an owner comes in thinking their cat has just been pickier than normal, or has lost some weight. Kidney disease can cause cats to lose weight, feel nauseous, and be dehydrated. Diabetes is another fairly common diagnosis, with symptoms very similar to chronic kidney disease. Likewise, hyperthyroidism is common, especially in older cats, and can again have similar symptoms. All of these diseases require bloodwork to diagnose. Another important thing that we look at when you bring your cat in for an exam is it’s body weight. It is estimated that 50% of cats are obese. There are many medical problems associated with obesity, including diabetes. Weight loss is also a common complaint, but without regular weight checks, it’s difficult to tell how much or how fast weight was lost. Along with those medical conditions mentioned above, there are certainly other things that can cause weight loss in cats. Dental disease can cause painful and inflamed teeth, which can make cats unwilling to eat well. Cats rarely show us their teeth, so unless we’re looking, dental disease is often overlooked as a cause to weight loss. Also, as cats age, they can lose their ability to smell, which can, in turn, affect their appetite. We also look for signs of arthritis because it can affect cats as they get older. It can be harder to notice because cats are so good at hiding their pain. The history you provide during a wellness exam can help to identify potential arthritis. Instead of limping, arthritis pain can cause a decreased appetite, changes in behavior, or make it harder to get to their food, water, and litter boxes, particularly if they have to jump or use stairs. So when was your cat last seen by a veterinarian? If it’s been more than a year, then your cat needs to be seen by a veterinarian. If your cat is older than 7 years of age, your cat should have an exam every 6 months in order to more carefully monitor it for potential senior-related conditions. There are many conditions that are easily missed or caught too late when regular wellness visits aren’t done. So bring your cat to see us!! To celebrate we are offering some huge savings from August 22-September 2, 2016. Contact us today to schedule your exam and get your cat on the path to good health!